Sometimes we can’t wait to get the Bible open and preach. Other times it is a battle to get to the preaching moment. But one of the most dangerous times is when it just feels flat. I didn’t preach last Sunday and I am not preaching this Sunday. So perhaps it is a safe time to write about this danger. On the dashboard of our ministry life we need to have a light that flashes when we are preaching flat. What causes it? What should we do? 1. Physical Fatigue – driven personalities, parents of young children, stressed church leaders . . . all are in danger of not sleeping enough. 2. Physical Lethargy – bad diet, lack of exercise, high stress levels . . . it is easy to be running on empty, but it is not a good idea. 3. Emotional Drain – perhaps there are issues in the family, or tensions within the church, and be especially wary when you have been on the receiving end of criticism or character assassination . 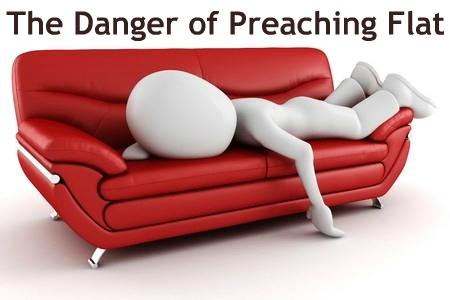 . . a drained emotional tank can lead to preaching flat, or preaching angry – both are dangerous. 5. Spiritual Dryness – lack of real communication in prayer, Bible reading has become data-gathering instead of encounter, a lively relationship has drifted into mere disciplines, unconfessed sin has become normal and dulled your spirit, there are many reasons for spiritual dryness. The problem is that it tends to hide the flashing light on your dashboard. Your flesh doesn’t want to own a spiritual drift, but your ministry requires that you do. 6. Other – there may always be another reason . . . spiritual attack, medical issue, etc. So what should you do about it? Be honest with yourself and recognize when you are preaching flat. Pray about it honestly. Ask some trusted friends for anything they sense may be an issue in your life. And don’t settle for flat as your new normal. The Gospel, your God and the people in your church need a preacher whose inner fire is being stoked by being with God. The flat version just won’t do. ← Sowing to the Spirit? This post really spoke to me and was very helpful. I am not a “pastor” per se but I do lead our main bible study on Wednesday night. I am also a single man in my very very early 30’s. I noticed my preaching has become flat when I met a young lady who I was interested in. It was like my mind could not focus on the word OR the work. I’ve had to really force myself to concentrate and pray for focus. It really is an emotional drain and in some ways a spiritual drain. I do find that when keep the focus on God that he recharges my spirit. This may be an odd case, but it’s real and on going. Single men in ministry have strange things to deal with. Thanks for the reminder. Love the blog! Really appreciate this, Peter. It helps me to know how to pray for my own pastors and others who are preaching. Thanks, too, for your post on the Cor Deo site this week.